Comment Please intimate when post 2016 jcos will get one rank one pension whereas pre 2016 jcos are getting one rank one pension. Comment MY BASIC IS RS. 7360 AND GRADE PAY 1900 . MY DATE OF PROMOTION IS 25.01.2019 MAY 16. REQUEST MY BASIC AS ON JUL 18?. MY NEXT GRAD PAY WAS 2400. Comment Get the authotication letter from that hospital and give complaints to the nearest CGHS authorities. If it is emergency treatment they will give reference letter. Comment What is the procedure for admitting a cghs empanelled hospital in kolkata holding cghs life time card who is suddenly seriously ill.What action should be taken if the cghs hospital deny to admit cghs patient.It is an burning issue. Comment In reply to danish trak. Surely. 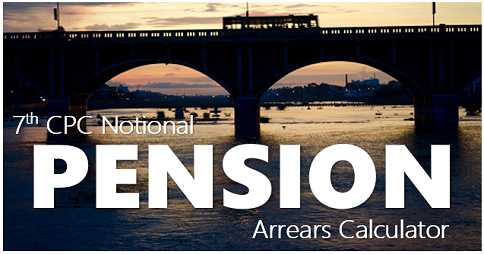 Revised notional Pension from 1/1/2016, If not received contact your ex-employer/PAO for arrears. Comment The application is perfect, but it needs legal follow up, because department is no mood to give the benefits due to our care. Comment In reply to Gopal thapa. 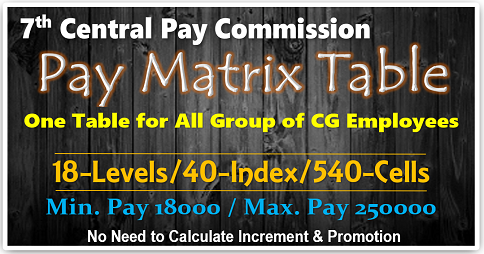 As per basic pay plus GP 4600 total last pay as 31/12/2015 multiple by 2.57 total amount equal to 7th CPC Matrix level 7 divided by 50% as revised notional Pension from 1/1/2016 plus D.R. as applicable rates from time to time, latest from 1/1/2019 as 12%. Comment In reply to RAMA. Comment In reply to Gayathri A. No it is not possible up to your mother’s until her life time. Comment My mother is family pension .I am unmarried daughter. Will I get depend pension& from which year. Comment In reply to Rathwa pradip. If it is MACP upgradrations from 2/3/19 of basic pay as ₹ 22400/- no increment on 1/7/2019 & next increment on 1/7/20 as ₹ 25500 in level 4. If the normal promotion due to retirement/vacant post only designation changes higher (next) from 2/3/19 no monitory benefits, same level 2 increment on 1/7/19 as ₹ 22,400/-. Comment Currently my basic pay is 21700 and pay level 2 .i got promotion on 2/3/2019 level 4.how to fixation my basic. Comment In reply to Padma. From the date of delivery maternity leave counts previous if any CCL it will be treated as cancel. If you want CCL it can be taken after 180 days. But increment will not be given if the leave exceeded 180 days. Comment Iam on CCL for 2 months, meanwhile I delivered. Now Can I avail maternity leave of 180 days from 2 months after date of delivery. Comment In reply to v tiwari. If it is MACP upgradrations on 20/2/19 your basic pay will be given with advance increment which is given on increment earlier so there will be no increment on 1/7/19, next increment on 1/7/20 as next higher level.If it is normal promotion due to retirement/vacant post no monitory benefits only higher designation as PGT from 20/2/19 in same matrix and increment on 1/7/2019. Comment In reply to NARAYAN SINGH. Comment Sir my grade pay was 2800 (level 5) and basic pay was 44100. I got 3rd MACP on 17 March 2019 to grade pay 4200 (level 6). My increment dt. on 1st July 2019 what should I got increment before upgradation or increment after upgradation. And I want to know my basic pay on 17.03.2019. Comment SIR MY BASIC IS RS. 9200 AND GRADE PAY 2800 AND TECHNICAL PAY 1400 AS ON DEC 15. MY DATE OF PROMOTION IS 18 MAY 16. REQUEST MY BASIC AS ON JUL 16? JUL 17? JUL 18?. MY NEXT GRADE PAY WAS 3400. Comment Now normal date of increment is July Ist. An amployee going to Superannuation Next May or June after serving 11 or 12 months. Any provision to grant next increment in May or June next year in connection with retirement. Comment Good efforts for Election topic in deeply opened so many items appreciate in this site not only for 7TH PAY COMMISSION NEWS for employees solvation and also for the latest updates daily NEWS about the citizens of India in large. Comparing to other sites improving more. Thanks for do the good job more and more for viewers. Comment in 7 pay commission was to give 3% formula. when govt accept it. Comment Sir, I was retaired on VRS 12.01.1991 in pay scale of Rs 750-940.i am drawing pension of Rs 9000/-.is there any arrears and pension revised, if so kindly advise me. Comment I am re-employed & currently working as Postal assistant in level 4 in Department of Post since Jun 2018. Comment Further to my comment on 2019/03/01 at 4:36 pm and Mr.M.K.Kumar’s reply on 2019/03/04 at 2:24 pm,the following inf. is given.My basic pay as on 30/6/13 is 35880.Additional inf.as may be required is also given.01-APR-05 to 31-MAR-06/11500,01APR-06-31-MAR-08/11725,01-APR-08-31-AUGO8/11950,01SEP08-30JUN09-29270,01JUL09-30SEP09-30150,01OCT09-30JUN10/32820,1JUL10-30JUN11/33810,01JUL11-30JUN1234830,01JUL12-30JUN13/35880,01JUL13-31-AUG13/36960.DOA,17/11/71 DOR31/08/2013 Ttl.Service 41yrs 9months 14days.Requesting help and guidance. Comment Sir, as per the recommendation of 7th CPC, child care leave will be 730 days. For 1st spell of 365 days leave the pay and allowances will be 100% and for the 2nd spell of 365 days leave, the pa;y and allowances will be 80%. But my question is without any specific order by DOPT, can a central govt. office deduct the pay and allowances into 80%. Sir recommendation is the different thing but if their is any order issued by DOPT then the central govt. offices bound to follow the order. Sir if their is any circular/order regarding the above subject please mention the same immediately if possible. Comment In reply to Santosh. My basic pay as on 31-12-2015 was 62420 with 53420 as pay and 9000 AGP. But I was promoted as principal on10-04-2018 and my basic pay was fixed as 69220 with pay as 59220 and 10000 AGP. No single increment was given at the time of promotion. Please give me my present basic. Comment It is clear that Pay is protected in case of reversion on own request but if reversion is made by Administration by the way of review DPC then what would be impact on pay if a central government employees? Pay will be protected or not. Comment I came premature pension in NOV 2004 completing service 17.years10 month & 13days.group -y what is my basic pension .sir pl reply as soon. REGARDS. 31/11/1991 as a Driller(PPO No 366999200318). He expired on 01/02/2006. Now my mother Sarbani Days gets a family pension. Her current besic pension is Rs.12,946(since September 2016).Can you kindly help us to know whether she is entitle to get a revised pension as per notification on 06/07/2017. If yes what will be her actual current besic pension and when it will be implemented. Comment I am a central govt employee. I have no idea about pay fixation on promotion or MACPs. My actual promotion date is 01 Feb 2018. Can you anyone help me with some example? Comment Sir, I have served in the Indian army for 22yrs,04mts&07days, often I am feeling my pension is less than Nike ranks, instead I am retired in Hav rank., So what is the exactly Basic pay for me please. Is she eligible to purchase car from CSD? Comment In reply to D SINHA. Comment In reply to Amar Nath Mishra. Amar Nath Mishra ji….Have you got fixed your salary with entry pay? Mine Case is also same? Comment ARMED FORCES SERVICES GREDUATION CERTIFICATE INDIAN RAILWAY ME STATION MASTER KI JOB KE LIYE MANYA HE YA NAHI ? Comment In reply to Murty. 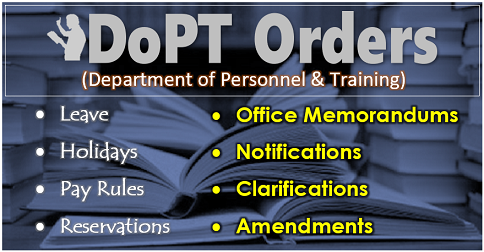 If the transfer orders were issued you can take as advance. Comment In reply to m.r.rajagopal. Contact your ex-employer/PAO they will prepare the arrears for more than 12years. 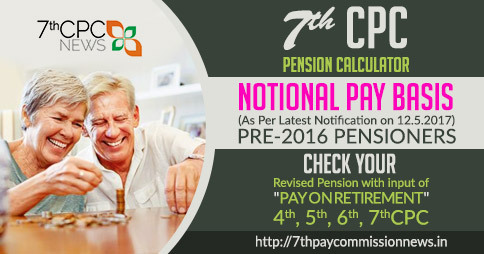 Your Pension will be fixed in matrix level 7 from 1/1/2016 until the settlement. i retired in hsg1 scale 6500-10500 in 2002 as per the latest govt.om dt4-01-2019 the grade pay has been increased to 4600 which becomes effective. Comment In reply to Raju. If MACP upgradrations on 11/3/19 basic pay from 11/3/19 as ₹ 41,100/- & no increment on 1/7/19, Next increment only on 1/7/20 as ₹ 44,900/- in level 7. If the promotion is on vacant post/retirement post no monitory benefits only designation changes higher (next) from 11/3/2019 as usual increment on 1/7/19 as ₹ 41100/- in level 6. Comment In reply to Rupali. If the upgradation is MACP from 15/3/19 you opt from this date your advance increment will given from that day of Rs.61500/-, but 1/7/19 increment will not be given and your increment on 1/7/20 as Rs.63,100 in matrix level 10(.PB 37400-67000 of 6th CPC). If the promotion is due to retirement/vacant no monitory benefit only designation changes higher (next). Comment Sir my grade pay was 5400 and basic pay was 59500. I got promotion on 15 march 2019 to grade pay 6600. My increment will apply on 1 july 2019. What should I opt increment before upgradation or increment after upgradation? Comment How to apply MP QUOTA IN 1CLASS , LAST DATE OF ADMISSION PLEASE GIVE INFORMATION2019-20. Comment Is Risk and hardship allowance is admissible during election duty? Comment In reply to Rekha. 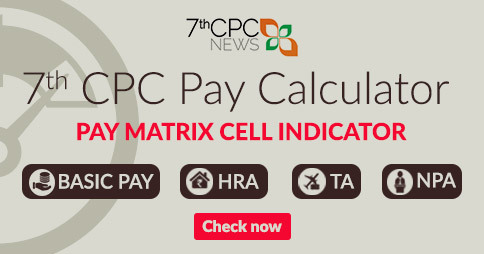 This is inform you that since you have already got promotion pay from that day that amount should be refunded than only your case is considered for new 7th CPC pay. 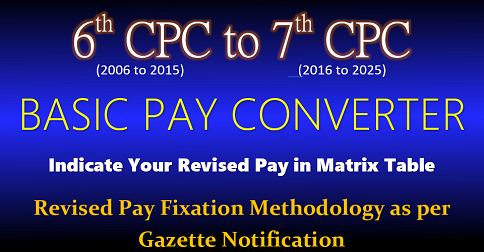 Not your pay from 1/1/2016, if you have opted from next increment your pay will be considered from 6-7-2016 and your increment will not be give on 1-7-2017 next increment will be from 1/7/2018 as next higher matrix level. Comment I am central government employee. I was promoted to the post of UDC w.e.f 06-07-2016 through LDCE examination. 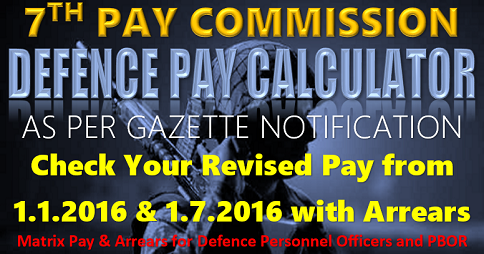 It is intimated that seventh pay commission announced on 25-07-2016. I have given an option from the date of promotion instead of 01-01-2016. Hence my pay was fixed in VI cpc after that 7th cpc. Now PCDA, Mumbai raised that the officer who gained promotion/ financial upgradation between 01-01-2016 to 25-07-2016 are to be fixed their pay in 7th CPC W.E.F 01-01-2016 but not from the date of next increment/ date of promotion/ date of financial upgradation. Request clarification on the case. July, 17 increment will be given from promotion date 6-6-2016, so you are not given increment on 7/17 your next increment on 1/7/18 as next higher matrix level. Comment In reply to SUBRATA PURKAYASTHA. Since he was appointed in 15/12/1998, his first promotion on completion of 10 years as on 15/12/2008 as GP 2000 to 2400 (1st Macp), then he got promotion on 20/6/2012 as GP from 2400 to 4200 (so he is not eligible for 2nd MACP i.e. completion of 20 years)) & on completion of 30th years only on 15/12/2028 as GP 4200 to 4600 (level 7). Comment In reply to Subhash Pandit. Comment In reply to vinod. Old level basic pay only, from the Increment on JULY in same level next year from july only, he/she will get in next matrix level equal or higher changes of his/her basic pay. Comment sir i want to know that if employee opts fixation on DNI and his DNI is in 1st July then and his promotion date is 22 Feb then from 22 Feb to 30th June which salary he/she will get. Sir, please refer my request on 21st of this month, I was retaired on VRS on 12.01.1991, at present am drawing pension of Rs 9000!-.ias not having English knowledge, my age is 75 years, I don’t have any coligues near by, my daughter went to my last serving office they don’t know about 7th cpc rules. I served as peon so I request you sir kindly reply me directly. Don’t tell to refer previous message, this is my honest request and oblige.